Barcoding and phylogenetic data from Lake Tanganyika endemics indicate multiple invasions and unsettle existing taxonomy. Therefore, we reject the hypothesis of monophyly for the sponges from Lake Tanganyika and challenge existing higher taxonomic structure for freshwater sponges. Standard MODIS Aqua Ocean Color products were found to not provide a suitable calibration for high altitude lakes such as the Lake Tanganyika. Our results show that for the geographical, atmospheric and optical conditions of Lake Tanganyika: (i) a coastal aerosol model set with high relative humidity (90%) provides a suitable atmospheric correction; A comparison between surface chlorophyll-a concentrations estimated from field monitoring and from the MODIS based dataset shows that remote sensing allows improved detection of surface blooms in Lake Tanganyika. Climate warming over the 20th century has increased the density stratification and stability of Lake Tanganyika, a deep rift valley lake. While lakes in general will increase heat outputs in a warming climate, heat outputs will increase more slowly in deeper lakes than in shallower lakes. ScienceDaily (Mar. 27, 2012) — Herpetologists from the California Academy of Sciences and University of Texas at El Paso discovered a single specimen of the Bururi long-fingered frog (Cardioglossa cyaneospila) during a research expedition to Burundi in December 2011. The frog was last seen by scientists in 1949 and was feared to be extinct after decades of turmoil in the tiny East African nation. Investing in water supply and sanitation will have immense economic benefits for households, communities, countries and the world at large. Estimates from the OECD put these benefits emanating from, time savings, health care saving, and productivity savings (productive days of the workforce, school attendance etcetera) at about US$84 billion per year if the water and sanitation MDGs were met. On 22nd March 2012, Burundi celebrated the World Water Day under the theme “Water in sufficient quality and quantity: source of life”. 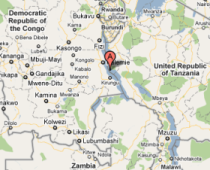 Related ceremonies took place in Kirundo Province, Busoni commune, in the zone of Gisenyi at Rwibikara, near Lake Cohoha. The Parliament recently adopted the first Burundi Water Code, a general law providing the standards, the guiding principles in the sector and the legal and institutional frame of water sector, to enable the good governance of potable water services for Burundian population and sustainable management of water resources in the country. The fifth meeting of the Lake Tanganyika Authority (LTA) Management Committee took place at Lake Tanganyika Hotel, Kigoma, Tanzania from 26th to 28th February 2012. The fifth meeting of the Lake Tanganyika Authority (LTA) Management Committee took place at Lake Tanganyika Hotel, Kigoma, Tanzania from 26 th to 28 th February 2012. The LTA Executive Director, Dr Henry MWIMA and LTA Director of Environment, Mr. Gabriel HAKIZIMANA received in audience by HE Second Vice - President of Republic of Burundi, Mr. Gervais RUFYKIRI on this Thursday, 23rd February, 2012. A workshop on the Draft Lake Tanganyika Regional Integrated Environmental Monitoring Programme (LTRIEMP) was opened at Bujumbura on this Thursday, 16th February 2012, by the Executive Director of Lake Tanganyika Authority, Dr Henry Mwima. In fact, a recent survey conducted by Nature Conservancy social scientists concluded that 95% of GME households earn income from farming. Rapidly growing village populations are left with little choice but to expand their settlements and farms into the wild lands and clear forest and woodland for agriculture, fuel and timber. Steep hillsides are haphazardly farmed and the run-off, heavy with sediment, fills coastal zones and pushes near-shore fishery production—the source of 40% of the protein for local families—into decline. Mimosa pigra is an invasive species in many places in Africa and is spreading. The highly destructive invasive, Mimosa diplotricha is in Bujumbura! Mimosa diplotricha is an invasive plant in some parts of Africa and has recently come to Burundi.